Ariel’s lyrical, compelling post on Monday set a high standard for our week here on NovelMatters. And then Patti vaulted over that bar with the announcement that her new book, Goodness and Mercy, is free on Kindle through today. You want a hint about what those two have in common? They are both terrific, unusual, unforgettable writing. I come to you as the street sweeper after the big parade. After a considerable time not writing on a full-length fiction project, I’m back working on an unusual (aren’t all of our NovelMatters projects unusual? That’s why you come here, right?) co-written project. Something I’m not yet ready to talk about. But I come to the writing of it changed. The period in which I did not write altered me. During a recent move I misplaced a little framed saying that always sat on my desk. When I found it this week, it explained something to me. This quote by Brooke Foss Westcott served as a warning to me for years. It serves now as an explanation. 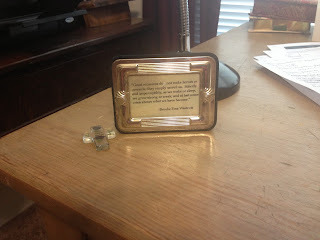 It probably hasn’t escaped your notice that the quote on this writer’s desk has nothing to do with writing. What written words do you keep on your desk? If it is a quote you have had for a long time, has your perception of, or reaction to, it changed over time? Blessings on your new project! Thanks for sharing the quote on your desk. Mine has been there for at least 15 years. Though the words are the same, the meaning has evolved according to my goals (some of which have been happily achieved). I have a wall filled with images, and a few different quotes. The two most important ones for me are scriptures that guide me on the writing journey: one explaining how I should write, and the other what, and why. Make a careful exploration of who you are and the work you have been given, and sink yourself into that. Don't be impressed with yourself. Don't compare yourself with others. Each of you should take responsibility for doing the creative best you can with your own life. Carla, I had never heard that quote by Thoreau. I see why a writer would need a reminder of the importance of putting structure and foundation beneath our ephemeral thoughts. Wanderer, I have thought a lot about Acuff's quote. If I had adopted that attitude lately, I think I would have been less discouraged by comparing myself to anyone else's successes. And of course, many people's middles are in a place I wouldn't want to go. I mean, can you imagine going into eternity known as the person who wrote Fifty Shades of Grey? Anyonymous, I LOVE the Galatians version that mentions creativity. Thank you. In fact, thank you to all three of you for what you said today. I have several quotes hanging next to my desk. The one that most speaks to me at the moment is from Helen Keller. "Everything has its wonders, even darkness and silence." I have no desk, I write wherever the Muse catches me but these sayings hang in my kitchen. I like those quotes, Henrietta! "God's silence is not an accurate way to measure what he is doing. It's easy to forget he often does his best work when, so far as we can tell, he doesn't seem to be doing anything at all. But looking back on those long agonizing stretches of God's silence, most of us will say those were the times in our relationship with God when he was doing the most." Sorry to say, I don't know who the quote is from. "The place where God calls you is the place where your deep gladness and the world's deep hunger meet." It takes more than the usual amount of inspiration to get this writer going. I need to add Prov. 31:8 to my list of quotes. It fits the novels I'm currently writing that deal with human trafficking and dark periods in our faith walk. Sharon and Patti, I love you dearest. Thank you for your quotes. Bridgette, those are really good ones. You guys are making me want to frame some more. But then if I type them all up and get them framed, I won't be writing. Rats.